Bing has just announced that they will be launching Upgraded URLs for Bing Ads with a rollout plan starting May 2015. As many of you are still planning out your migration plans for Google Upgraded URLs, the very thought of having to throw Bing into the loop right now may be panic inducing! However, there’s no need to worry, as we’re here to help provide you with all the information you need to make it through this transition smoothly. Bing is adopting Upgraded URLs in order to help make it easier for their advertisers to copy their ads from Google to Bing. Instead of having to adjust URLs when managing between Google and Bing, advertisers can save time and streamline their workflows knowing that their URLs will function seamlessly between the two publishers. With this launch, advertisers on Bing will be able to use their existing AdWords tracking templates (at the account, campaign, ad group and entity level) and URLs (both Final URL and Final Mobile URL) to reconstruct a Destination URL that Bing Ads is able to understand. 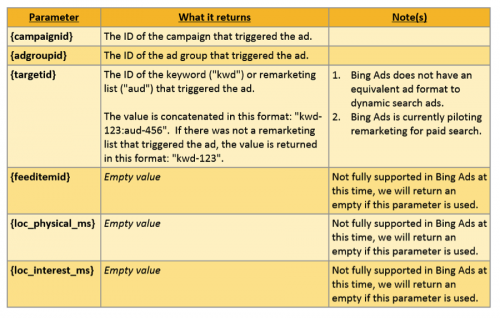 Bing has provided the following table to explain the effect of Upgraded URLs on destination URLs of text ads, keywords and sitelink extensions. 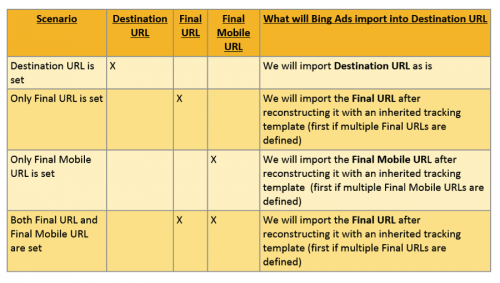 It also outlines how Bing Ads will handle Destination URLs, Final URLs and Final Mobile URLs during Google Import. However, it is important to note that Bing will not be able to import URLs with custom parameters in from Google. In addition to Bing’s support for Upgraded URLs, Bing is also rolling out support of new dynamic text placeholders in Bing Ads Destination URLs. Continue to stay tuned; we will be sure to update you with more details on this launch as they’re provided!